The Confederate Memorial to Men of Bibb County has been standing watch in downtown Macon since 1879. The unnamed man represents those killed during the Civil War between 1861 and 1865. As many as 45,000 people packed downtown Macon on October 29, 1879, when the statue was first erected close to the Bibb County Courthouse. The Georgia State Fair used the dedication to draw more people to Macon and away from a rival fair in Atlanta. Gov. Alfred H. Colquitt attended the ceremony, which included a 100-gun salute and a fireworks display. Inscribed on the monument are the words "In Honor of the men of Bibb Co". 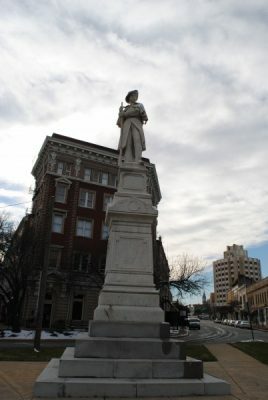 The monument has a confederate soldier on top of the 20ft structure who wears a long jacket and a hat and holds a gun. Structure was cleaned by sandblasting in 1956 when it was moved from the intersection of Mulberry and 2nd St.